Day 20 of Whole30; Day 8 of 18 sessions of Boot Camp. Neither is easy for me and there are days I am ready to quit ALL of it. But I won’t and here’s why: compelling motive, accountability, fun (are you kidding me?) and ripple effect. I discuss those things over at The Art of Simple on Thursday, but it occurred to me I’ve been presuming “everyone” already knows what the Whole30 is. Based on the number of times I’ve had to explain it to friends in real life, I thought it would be helpful to elaborate here. 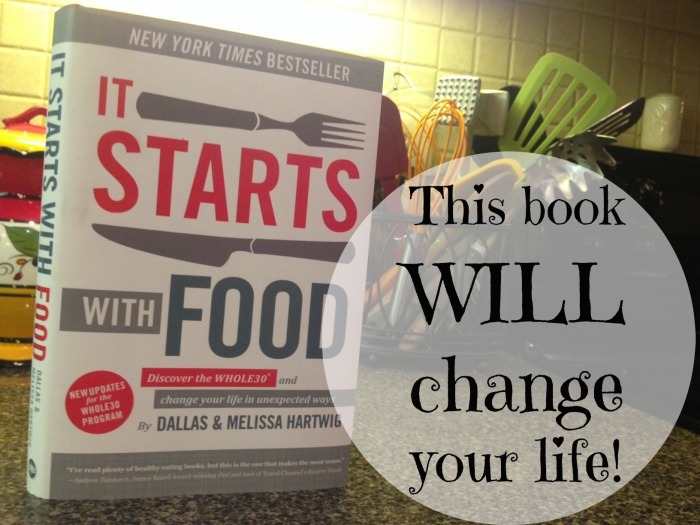 Whole30 is the program based on the New York Times Bestseller, It Starts With Food by Dallas & Melissa Hartwig. It got on my radar last year after my husband discovered it. Cute story: He stumbled onto it searching “how to cook a sweet potato” when I was out of town one weekend. sugar or sugar alternatives, added sugar or did I say SUGAR yet?? And while that seems like you can’t eat anything “good,” in essence, that’s all you can eat! I told him I could never do it. Rather than me plagiarizing the Whole30 Program Rules, pop over to their site and skim the details (and then buy the book. Seriously. Its appeal to logic, sound reason and physiology just makes SENSE). What the Whole30 Program is NOT about is calorie counting; never once did I worry about how many calories I was consuming in a day. Because everything I put in my mouth was unprocessed, fresh food, calories were never an issue. Doing the Whole30 is not about weight loss (though I lost 8+ pounds during the month); my personal goals were jump-starting an anemic metabolism and trying to get better sleep. Apparently my food choices were sabotaging both and I was amazed to learn how much what I eat is adversely affecting hormone levels. And while I didn’t feel great while I was on the program (many people do experience that), I could tell I felt worse after returning to some of my favorite junk foods. For me, afterwards was when I could tell the difference. Anyway, it’s really worth five minutes of your time to find out more. This is NOT a sponsored post in any way, shape or form; I sincerely want to be a cheerleader for good health and better lifestyle choices. Are you already a subscriber? If not, please do by clicking here & adding your email!! One of Whole30’s goals is to encourage trying new foods; and while I’ve always loved cauliflower, my favorite way to prepare it was steamed then bathed in a creamy cheese sauce. Because of Whole30, now we eat it roasted, a much healthier alternative. There’s not much to it, but I can’t believe I never tried it until a year ago. Preheat oven to 425. 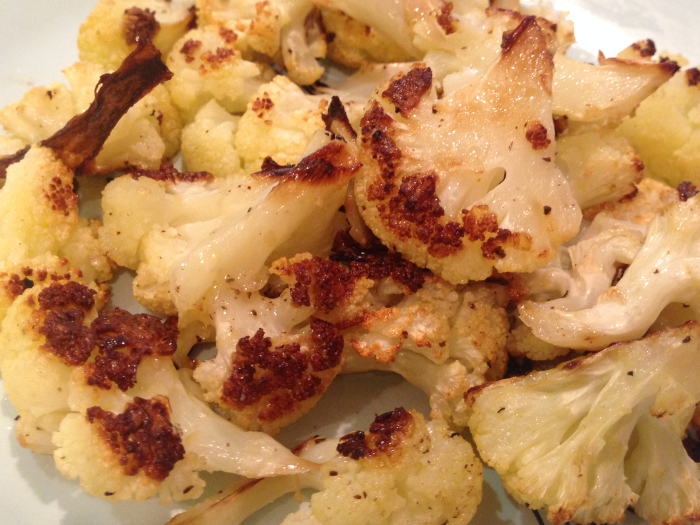 Toss florets in a large bowl together with olive oil, salt and pepper. Spread in a single layer on a cookie sheet and bake for about 20 minutes. Don’t be afraid of the browning, it adds a rich buttery taste to the florets. 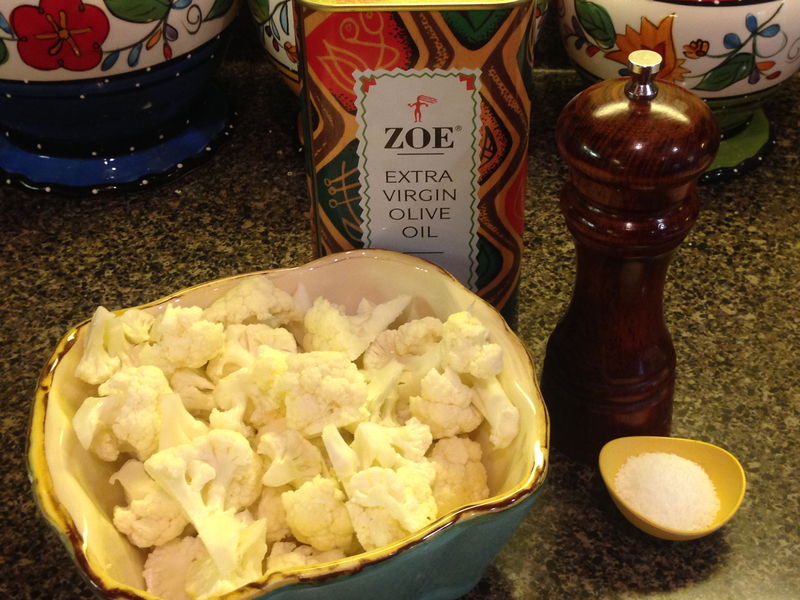 You can add garlic or your favorite herbs, but I’ve found I like it simply prepared best. Remember, no cheeses on Whole30 so Parmesan is a no-no. I’ve been on the fence with trying whole 30. My biggest concern is breakfast. What do you eat? All of the whole 30 breakfast recipes I’ve seen have eggs or are a banana smeared with nut butter. I can’t eat eggs or nuts or bananas due to allergies! I guess I could eat a bunch of fruit, but fruit doesn’t fill me up for very long. The one thing I’m doing now for my health is quitting diet coke. I pretty much quit it at the beginning of last year and I lost 25 pounds in about 8 weeks. I’m serious. That’s the only change I made. Then I started drinking it occasionally which led to more often which led to every day. And I’ve gained back some of what I lost. So I’m trying to quit again. It hasn’t been as easy this time around, but knowing that I did it once is helping me to know that I can do it again. I’m afraid if you’re allergic to both eggs and bananas, it will be much harder for you than people who aren’t. I googled “Whole 30 allergic to eggs” and found options; also on the Whole 30 forums I searched for answers. There are people who are committed to the program despite allergies, but they eat a lot of leftovers for breakfast and other things that aren’t so typically “breakfasty”. I’ve clicked a few sites that say they have lots of non-egg breakfast ideas, but then most of them DO have a lot of egg recipes w/the occasional alternative. GOOD LUCK again with dropping Diet Coke, though!! I rarely drink soft drinks anymore at all (when I’m not doing Whole 30) because they seem toxic :/. I don’t need the sugar in regular drinks and I don’t wanna put all those ingredients in my body for the diet versions. Maybe soon you’ll find it easier…hope so! THANK YOU for sharing your recipes! I cannot imagine what that sweet potato casserole tastes like…I wish I could try it first :). This is the 3rd one we’ve done, though the second was only about 3 weeks (can’t recall why we cut it short). It’s easier this time; I think mainly because I didn’t have to get used to drinking black coffee. It sounds like a good idea. I don’t think I could quit the sugar. I am a southern gal (NE TN) and love my hot sweet tea! It might be worth a try! I’ve always said I couldn’t go without sugar. Apparently, with proper motivation, I can :).